Hello - I couldn't wait to use this Scentsational stamp and die set from Stampin Up and I used the Sugar & Spice Embossing Powder on the mug so it smells yummy!! I wish I could have got a better picture, the background is sooo sparkly :) After embossing with the snow burst embossing folder I stamped it with versamark ink and added Irredescent Ice and heat embossed it. 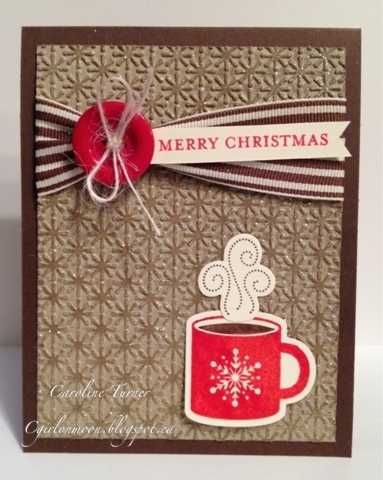 This card is perfect this week for the The Paper Players Challenge #116 - Cup of Joy. I can see the sparkly-ness in your picture....love the ribbon treatment, and of course, your little cuppa is the best! Thanks for playing along with my Paper Players challenge this week! Whata a pretty card! I love the sparkly embossing...what a great touch! Your ribbon choice works perfectly with this clean layout. Thanks for playin with The Paper Players! Ooh, fun card! I have yet to use my yummy scented powder, best get on that!